I try to create a post for my blog twice a week. Sometimes it happens, sometimes it doesn't. This past week and 1/2 has been busy with visitors. When we lived in Ajo, way, way in the boonies of the desert of southern Arizona, a (very) few intrepid friends made the trek to see us. One of the things I hoped for when we moved to Oracle, is that our friends might be more inclined to visit. In reality, Oracle is the same distance from Phoenix, but because it's just north of Tucson, there's the appeal of a really interesting city nearby. Plus, living at 4500 ft. elevation means that we're cooler here, a real incentive for Phoenicians, and less of a disincentive for other friends from cooler climes, to come visit. So, my wish is coming true. Which brings up the title of this post, Balancing Act. And yes, it is. A balancing act. The act of entering the studio and getting to work can be daunting. So much rides on the success or failure of every creative attempt. It's hard to ignore the cost of the materials required to do the work. 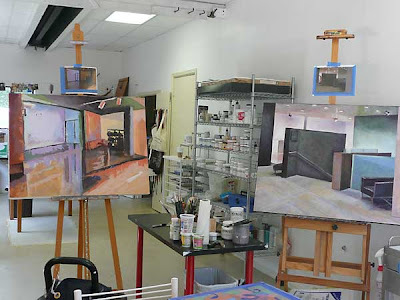 Studio work has to go hand in hand with figuring out how to manage an art career, which includes marketing and selling art, and many other tasks. And then there's doing the laundry, cleaning the house, and making time for friends and family. The photo above is a beginning and a finishing. I just started the painting on the left. If you look back at previous entries, I've been working on the painting on the right for some time. I'm not sure how long, because while I intended to track my time on this one, it didn't happen. Yesterday, when I entered my studio, I thought a few small touches would complete the painting. Hours later, I was still working on it. When I go to look at it today, I hope I'll be able to call it done, and begin to concentrate on the painting you see below. I've just finished the fun stage of this one, where everything seems possible. I literally dash paint onto the canvas, keeping it loose and experimental. 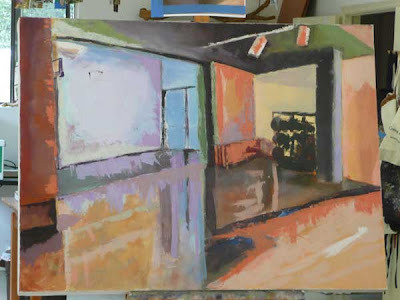 Next step is to look at proportions and angles and begin to work with color. The next step for the painting above (assuming it will stay finished) is to sign it, title it and photograph it. (A real, James Cowlin photograph, professional and accurate). Then I enter it into my Bento record of paintings, with dates, size, title, media, price, location. Next I'll enter it into my various on-line galleries and websites. This, too, is time consuming and not so fun. But necessary in keeping track of my work. I'm grateful to Alyson Stanfield, my guru of all things art business related. Her book, I'd Rather Be in the Studio: The Artist's No-Excuse Guide to Self-Promotion, has been instrumental in my progress in balancing the art in being an artist with the business aspects. I have an accurate record of my work, thanks in large part, to the suggestions in her book. Her weekly newsletter helps to keep me on track. You can view her website and subscribe to the free newsletter at Alyson Stanfield's website. A new book, The Artist's Guide: How to Make a Living Doing What You Love, by Jackie Battenfield is a great companion book to Alyson's. I just finished it, and I love her approach. Now I need to start at the beginning of the book and follow her advice! 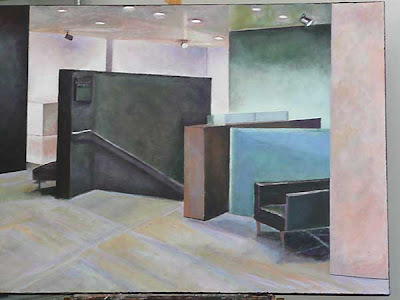 The reality of being an artist is that more than 50% of time has to be spent on the business aspects of the art practice, in order to move ahead in an art career. Which brings me to the point (at last) of this blog post: I'm continuing on the theme of what it takes to be an artist. It's not just all fun and games. It's lots of hard work and like any job, includes plenty of stuff that you'd just rather not do. The difference is that because it's completely self directed, it takes buckets of determination both to make the art, and to promote it. Balancing the art making, art promoting, and the rest of life is an art form in and of itself!